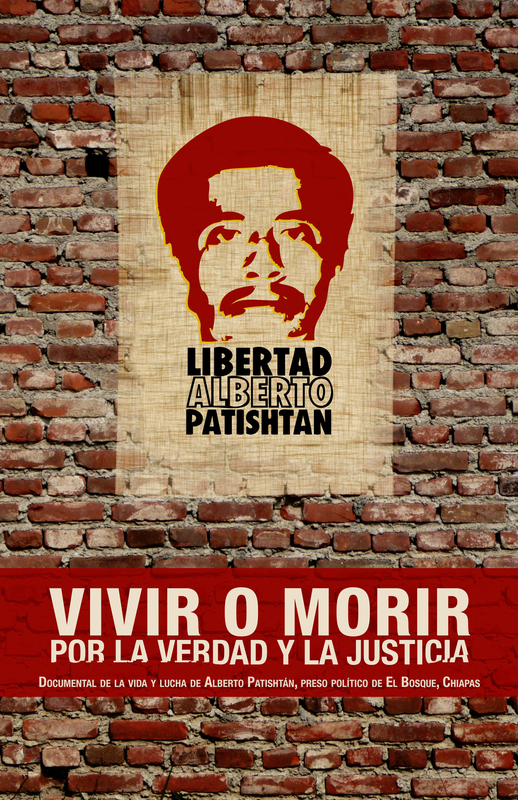 For the teacher Alberto Patishtán, the way in which he gets his release is much less important at this time than the fact that it finally happens. Whether through a possible presidential pardon, a law of amnesty or even the long route of the Inter-American Court of Justice, he says, the priority now is to end the imprisonment that began thirteen years ago for a crime he did not commit. In an interview with La Jornada at a clinic located in the south of the city, where he is currently receiving medical treatment for a brain tumour, the Tzotzil activist commented on the meaning of all these years of confinement, the persistence of abuses against members of the indigenous peoples and, of course, of his release which has been postponed so many times. As may be recalled, Patishtán was accused of involvement in the killing of seven policemen that occurred on June 12, 2000, in the municipality of El Bosque, Chiapas, where he originated. He was subsequently sentenced to sixty years in prison, despite evidence that at the time of the crime he was elsewhere. -Professor, how do you feel in health and spirit to face all this process? ="I'm not well, because I'm in a prison. In terms of health, it has always been bad due to the lack of attention in the CERESO where I've been held and in the other prison, too. When they operated on the tumour a year ago, they didn't remove it all, and it appears that it began to grow again. I don't bear it very well, but we try to live all that is possible in every minute of every day." -How do you keep from breaking down in the face of a situation in which many would perhaps have already broken? -I just put myself in God's hands, and that is how I've been for all this time. It's essential for me to entrust myself to God. The other thing is that I have a clear conscience. I did not commit the crime that they attribute to me. I am at peace to move on, because I feel free and innocent. I only long for my freedom, physical freedom," he says with a calm countenance. -How did you take the fact that the first Collegiate Tribunal of the twentieth Circuit denied your freedom? How do you interpret this ruling? -"I feel outraged, with anger. Although we already know what the justice system is like, that for those of us who are prisoners, it keeps us here due to our lack of resources, perhaps because of our race and all that, I really was not expecting it. In my mind I was calm, because I already know the way things are, but I was also waiting for a little miracle," Patishtán confesses between laughs. -How do you take the fact that you remain in jail but Florence Cassez has been released, or that they have returned the properties of Raúl Salinas de Gortari to him? What kind of country has Mexico become? -The authorities are inflexible, they have no conscience. They recently released another (involved in the massacre) at Acteal, when he has already confessed his guilt. But I, who have provided much evidence and a mountain of proof, I am not released because they do everything backwards. The authorities walk with today's leadership." -Are you aware that you have become a kind of symbol against the existence of political prisoners? -I only know that I do a little for me, but there are many cases like mine. There is one of a compañero who is still struggling with me. His name is Alejandro, and he was arrested in Veracruz and sentenced to thirty years for a crime he did not commit. They put a Tzotzil translator there in Veracruz, but the sad thing is that the indigenous people in Veracruz do not speak Tzotzil. In the CERESO where I am now, there is only one defender for 500 inmates. What can one defender do with so many people? There is also a young woman called Antonia; she has spent ten years in prison (without a sentence). They could judge her and say that her sentence is six years. What about the other four years? -It is said that there are three ways you might be released: a pardon, a law of amnesty and going before the Inter-American Court of Justice. How do you see these options? -What's important to me is that they release me! That's it! "Ask for pardon? Only if I had lied!" -That's right, I would have to do it if I had been lying. What I want is for them to free me - The Tzotzil teacher responds emphatically, in the face of the reporter's persistent questioning regarding the issue of how he might arrive at that point. -At this time, how important are the themes of justice, truth, reparation of damages? -I haven't even thought about that. I don't know, time will tell. The first priority is my health. -What are your plans for after leaving prison? How will you face this stage? -Right now I feel that I'm living a very different world. I don't see beyond what is happening. I don't know what the environment is, so I can't comment, but a candle that gives light isn't put under the bed so no one can see it. It's always placed on a nightstand so everyone can see. -What would be your message to the people who support you? -You have to keep fighting. We should not wait for justice, because that way it will never come. There are many tasks; sometimes there's not even time for a rest. Carry on with a little or with much, but keep on. -And for the President, the Congress, the politicians who are going to decide on your release? -Let them act with justice and with truth. No more.